An entertainer was leaving a job using the service entrance in the back of a concert hall. There was no outdoor lighting or safety marking to aid in exiting the hall safely. She exited the door onto the loading platform and did not see the 2 steps down to the parking lot and fell hard, severely fracturing her wrist. Due to the damage to her wrist she required surgery, an infection developed and she developed CRPS, Complex Regional Pain Syndrome, a long term pain condition, rendering her unemployed. We were asked to create visuals that enhanced the expert's viewpoints. The purpose of these storyboards and animations was to educate jurors to the cause of the injuries and resultant long term pain that resulted. 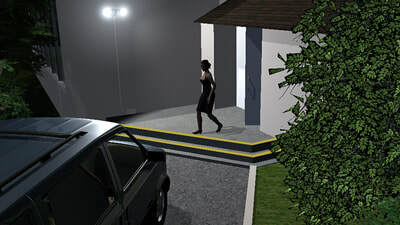 We contrasted the non-existent lighting at the time of the accident to the corrective actions the venue took after the accident, including brighter flood lighting and yellow safety paint on the nose of the two steps. By showing the conditions from the concert hall through the unlit hallway out to the loading dock, jurors could see a pattern of neglect on the venue's part in providing a safe well lit means of egress for performers and service personnel. In order to create these exhibits we used input from a variety of reference materials and experts involved in the case. We worked with depositions, architectural plans, expert engineers, the surgeon, a CRPS specialist and a psychologist specializing in spatial orientation and motion perception. The animations were created to reflect their viewpoints and to make it easier for the jurors to understand what was involved in a fall of this type. In addition we supplied medical animation to show the procedures the plaintiff had to go through to remedy the injuries.